Cookies & Candies: Color My World! You must be thoroughly sick of me harping on about adding colors to my otherwise rather lacklustre wardrobe. My favorite color has always been blue. I've always naturally gravitate towards the color. Lately, I've made some progress which I'm rather pleased about, having ventured into yellows, violets and blues. I'm a rather conservative dresser but with an added twist of bohemian. Whilst I tend to feel most comfortable dressed in neutral colors, I like my accessories to take the spotlight. I tend to gravitate towards colorful bags and costume jewelry. In fact, up until recently, the only black bag I've ever owned was a Longchamp Le Pliage tote. 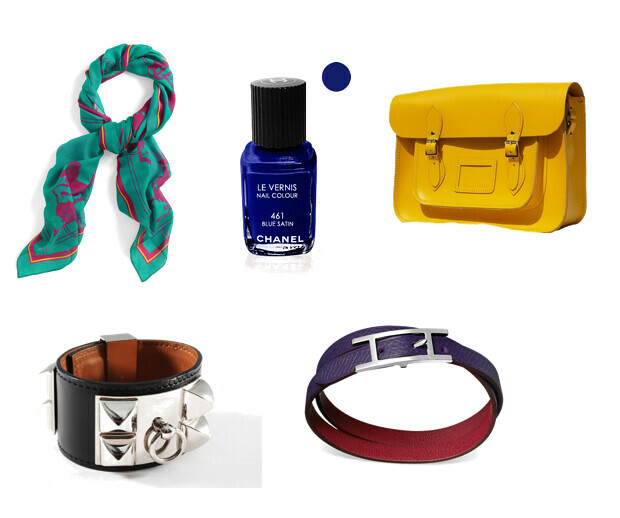 Here are some of the colorful accessories I'm eyeing at the moment. Now about the Hermes Collier de Chien bracelet...... since it's a statement piece, it's eye-catching enough in black. Love all those colorful accessories! Maybe a little partial to the CdC and H jersey, but they are all beautiful!! I understand about the colors! My brother-in-laws used to call me the "black widow" because I wore so much black. I had to expand my horizons with more color too! I need to follow in your footsteps! Samantha, isn't the H shawl beautiful? I'm exactly the same. It's only recently that I'm branching out of the usual black and grey look. Lauraloo, I love the way you dress! Don't change anything. I checked out the website of the Cambridge Satchel Company and I'd like to have an orange 11" one. Just thinking if it's not super duper bright as it's fluorescent. DA, all the shops I'd been to that stock Cambridge Satchel company bags tend to stick to the boring blacks and browns. I've only managed to see a yellow bag on a SIA flight attendant. I think the orange color isn't too far off from Hermes' as I'm not keen on fluorescent ones either. Mmm ... if it's more leaning towards H orange, I might consider ... now gotta do some thinking lol!